The mountain wasn’t revealing its beauty too easily. We had to earn it. A sudden downpour bombarded our initial ascent from the trailhead, which in itself was an arduous undertaking: we had to crisscross a shallow stream, battle thorny foliage and clamber up steep slopes for hours to reach the first lantawan (lookout). By the time we got there, we were soaked to the bone in rain and sweat. Nevertheless, the entire climbing group — writers, forest rangers, local tourism officials, police officers — was egged on by the fact that we were negotiating no ordinary mountain. We were hiking through the forest-cloaked highlands of Mount Hamiguitan Range Wildlife Sanctuary along the Pujada Peninsula of Davao Oriental. Long known only among scientific and mountaineering circles, this isolated mountain range emerged from obscurity when the 26,000ha protected area was declared the country’s newest UNESCO World Heritage Site in 2014. Mt. Hamiguitan Range Wildlife Sanctuary is Mindanao’s first UNESCO World Heritage Site. Ant plants live symbiotically with colonies of ants. The three-day assessment climb, organized by the municipal government of San Isidro, the gateway to the national park, was in preparation for the reopening of the wildlife sanctuary to recreational hikers later this year. Since 2010, access to the core zone had been limited only to scientific exploration. But with protocols set in place to manage the impact of tourism, the mountain will soon welcome recreational climbers again. Rising only 1,620m above sea level, Mount Hamiguitan’s biggest draw isn’t its stature. It doesn’t quite match up to Mount Apo, which straddles North Cotabato and Davao del Sur — at 2,954m, the country’s tallest mountain is almost twice Mount Hamiguitan’s height. But what sets it apart is the sheer diversity and variety of its resident wildlife. As we crawled deeper into the riotous jungle, our group frequently encountered astonishing plants and animals, many of them found nowhere else on the entire planet. Nepenthes micramphora thriving along the trail. Nepenthes peltata can only be found on Mt. Hamiguitan. We were led by local tourism officer Antonio Edquila, who has explored these upland forests countless times. 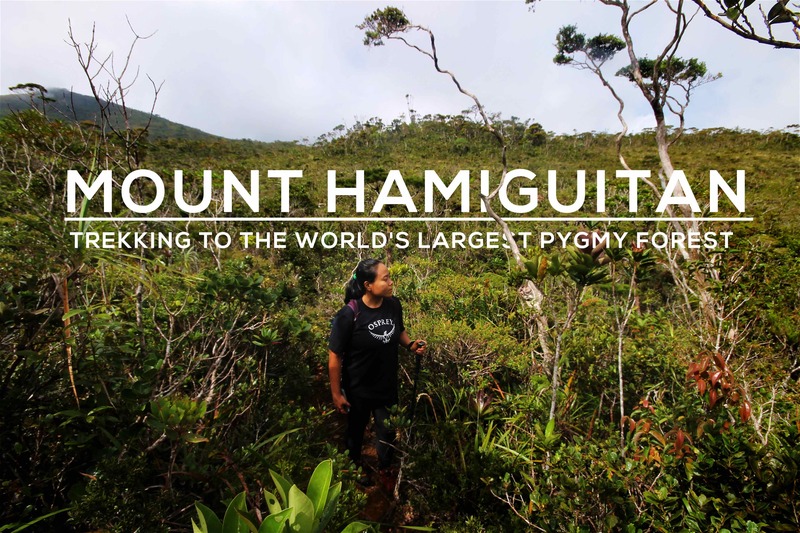 He dubs Hamiguitan the “learning mountain” with its incredible biodiversity of more than 1,400 flora and fauna species across five different levels of vegetation: agro, dipterocarp, montane, mossy and mossy-pygmy forests. Among the unique animals that call this mountain range home are the country’s iconic fauna like the Philippine eagle, Philippine tarsier and Philippine cockatoo. Intriguingly, there are also species found only on this mountain such as the Hamiguitan hairy-tailed rat (Batomys hamiguitan) and Delias magsadana butterfly. Antonio is a fast and nimble hiker who is able to recognize the distinctive calls of bleeding-heart doves and tarictic hornbills, and as well as identify varieties of pitcher plants by their scientific names. The Philippines currently has 53 species of Nepenthes pitcher plants — with new ones continually being discovered every few years, making the country the global center of pitcher plant diversity. These plants are curious-looking climbers with cup-shaped leaves that lure, trap and digest insects and other small prey. The nature reserve harbors eight species of these carnivorous plants, half of which are only found in the immediate locality. Among them are the Nepenthes peltata, which we spotted flourishing on a precarious slope of loose gravel with their bulbous red-hued pitchers, and the Nepenthes micramphora, suspended from trailside shrubbery with their small and delicate pitfall traps. “Botanists go crazy with excitement over their discoveries here,” Antonio told us. Further down the trail, he pointed out another local marvel, a short-haired paphiopedilum, an endemic ground orchid threatened by poaching and forest destruction. Our campsite at that summit area, near the pygmy forest. The first day’s 11-hour hike was a mere prelude to day two, when we explored the summit area at a slightly more relaxed pace. The chilly air coaxed us out of our tents early in the morning at base camp, which we shared with student researchers headed to study leeches inhabiting the highest peak. Later that second day, we explored the mossy forests of the summit area, festooned with blossoming orchids, fuzzy lichen and other tree-loving flora called “ant plants” that live symbiotically with colonies of ants. And, at the topmost level, the trail opened to an unbelievable landscape and the crowning glory of Mount Hamiguitan’s diverse ecosystems. The highest peaks are blanketed with more than 1,200ha of the world’s largest pygmy forest, composed of centuries-old trees stunted by the mineral-rich volcanic soil. Indigenous hardwood such as almaciga, dita, dapdap, and bitanghol, which typically grow several stories tall in ideal conditions, are shrunk down to an average height of only 4.5ft. The lush expanse of gnarled natural bonsai dotted with white-flowered Dendrochilum kopfii ground orchids (yet another endemic species) was otherworldly. As we slogged up narrow paths of reddish mud, the pygmy forest made us feel like giants towering over treetops. Curtains of fog grazing the low-lying canopies added to the fairytale atmosphere. Lindseae hamiguitanensis – a fern species only found on Mt. Hamiguitan. Hidden Garden is a mysterious grove of dwarf sagimsim trees. The summit trail finally took us to Tinagong Dagat (meaning “hidden sea”), an ancient volcanic crater partially filled with a mist- shrouded lake, which indigenous Mandaya people believe experiences changing tides, hence its name. The phenomenon is likely caused by varying amounts of rainfall throughout the year, affecting the water level of the lake. A short hike away from the crater was another mysterious site called Hidden Garden, a grassless grove of dwarf sagimsim trees. Locals attribute their pruned appearance to engkantos or nature spirits who live deep within the forests. Stick insect living in the pygmy forest. Mt. Hamiguitan Range is crowned with 1,200 hectares of the world’s largest pygmy forest. Pygmy forests are telltale signs of significant mineral deposits, and as such they also pique the interest of mining companies. Fortunately, Hamiguitan has been spared from the destruction that has befallen other ore-rich mountains, chiefly thanks to San Isidro mayor Justina Yu, a staunch defender of the mountain range for more than 50 years. Her unwavering dedication to protect one of the country’s last remaining swathes of old-growth forests against lucrative industries like mining, logging and large-scale plantations are mainly credited for the mountain’s inscription as a World Heritage Site, and, later on, as an ASEAN Heritage Park. Centuries-old trees are shrunk down to an average height of 4.5 feet! Learn about the mountain range at the natural science museum. The museum features a central ramp modeled after the mountain’s five levels of vegetation. The municipality of San Isidro, Davao Oriental is the gateway to Mount Hamiguitan Range Wildlife Sanctuary. From Davao City Overland Transport Terminal, take a Sigaboy-bound bus or van to San Isidro. Alternatively, head for Mati City, alighting at Manikling Junction, where you can transfer to the town center by habal-habal (passenger motorbike) or tricycle. The total travel time is at least three hours. Looking for a place to stay in Davao City? Find deals on your accommodation here. A very nice post 🤙we been wanting to climb Mt Hamigutan since 2yrs now,do you have any contact with the lgu tourism officer? Trying to google online got Antonio Edquila’s email but got no response. Hoping you have any direct contact with him. Thanks! Thank you, I’m glad you enjoyed the post! Did you try contacting the number of the tourism office listed in this article? Hello Edgar, what an amazing adventure. There is so much places to discover in the Philippines. Oh yes, hope you get to hike Mt. Hamiguitan too!